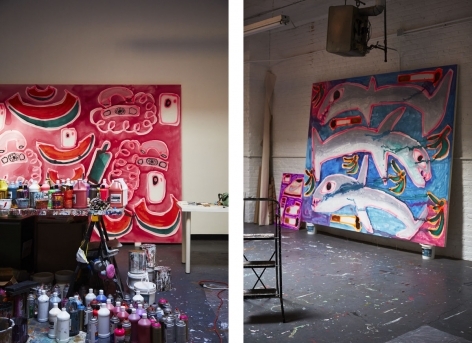 Despite her having just closed three concurrent solo shows at the New York and L.A. locales of Venus (formerly Venus Over Manhattan and Venus Over Los Angeles) and Carl Freedman, the long, narrow space is bursting at the seams with brightly colored, electric paintings of watermelons, sharks, and bananas. Some lay on the paint-splattered cement floor, drying; others are rolled in plastic or propped up on empty paint buckets against the walls. But to get to this painter’s haven, brimming with spray paint and gallon jugs of acrylic in infinite lush colors, you must pass through a lair of Moroccan rugs, piled high and tacked across the walls. It’s an ideal playground for Bernhardt’s four-year-old son Khalifa, who alternates climbing and lounging on the stacks and goes relatively unnoticed save for his scattered Mack Trucks and toy cars. But it also serves as a well of inspiration for Bernhardt’s surprisingly codified works and the flagship for her Berber rug importing business. In 2008, following a childhood dream to live author Paul Bowles’s stories of Moroccan travels à la The Sheltering Sky, Bernhardt visited a friend in the Peace Corps, who coincidentally was learning to weave in Morocco’s Valley of the Roses. “We were in this village with all these weavers,” she said. “We would go around their houses and see what they made—it was amazing—the color combinations, the materials, the textures, the symbols.” Soon after, she formed Magic Flying Carpets, the aforementioned carpet business. (If not in her studio, you might have seen it set up shop at the NADA fair or at long-time gallery CANADA.) “I’d always wanted into the fantasy of Morocco. Everything there is awesome. Like, everything,” she says, her magenta lipstick matching a purple cashmere sweater. The route from pile-wool to painted canvas isn’t so meandering as one might think. The cell phones, Nike shoes, Duracell batteries, and Mr. Coffee makers that fill Bernhardt’s paintings serve as contemporary analogues of the motifs that pattern her beloved rugs. “The symbols all mean something—it’s just like a painting,” she says of the emblems that decorate the carpets. 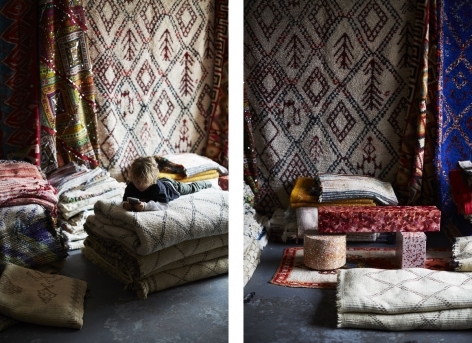 Since the Paleolithic era, these textiles have been woven by women of Morocco’s Berber tribes, who embed them with symbols (diamonds, X-shapes, chevrons) representing themes from sexuality to the natural world in a code passed down through generations. “There’s an anti-evil eye,” she says, motioning to a hanging woolen rug. 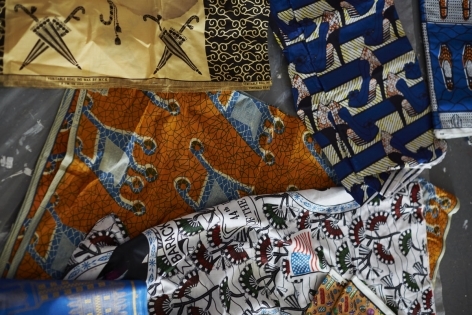 “Those could be fields or rivers or mountains, and vaginas—it’s all females who make them, so it’s all about birth.” Where these women conjure patterns that stem from prehistory, Bernhardt adds sharks and cigarettes, sea turtles and socks. 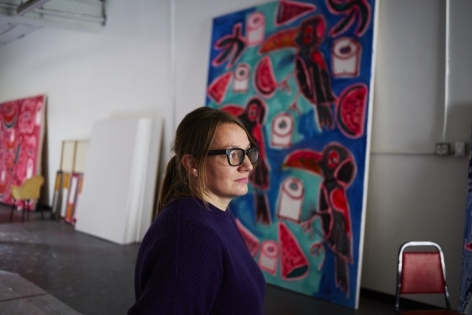 “My new paintings are kind of like symbols of modern daily life and culture,” says the artist. 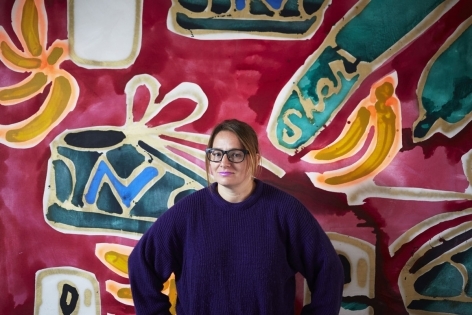 The new series represents something of a return to form for Bernhardt, who began her career making still-life paintings of objects like laptops, shoes, a piñata, or nail clippers during undergrad at the School of the Art Institute of Chicago. After an MFA from the School of Visual Arts, she moved on to paint a decade’s worth of pop-cultural icons and fashion models—a scarlet-haired Rihanna, a Versace model lounging by a pool—in loose, figurative strokes. Next came paintings of carpets at the onset of her love affair with the Maghreb, with abstract fabric collages inspired by rug designs shown at The Hole in 2013. This was the jumping-off point for her latest pattern paintings, where objects, combined on a whim (“It’s usually things I’m obsessed with, or like to look at,” she says), swarm in newfound harmonies. Who knew a slice of watermelon would find its mate in a tangled rotary-dial phone? Whether a Moroccan souk or the open-air ethnic markets on a nearby block in Flatbush, place plays into everything for Bernhardt. Her most recent works were inspired by a residency in the Caribbean, where the landscape of San Juan, Puerto Rico—the artists, the community, the sun—became a mural outside of Adam Lindemann’s Venus (formerly Venus Over Los Angeles). (Her son helped her paint it, she notes, as he climbs onto her lap.) The exhibition hopped the heartland to New York, covering the East Coast Venus’s floors with empty burlap coffee sacks and its walls with paintings festooned with sea life and fruit. “I’ve been going down to Puerto Rico for 10 years,” she says. “It’s so colorful and so bright—it’s just fun to paint like that. I love it there.” And Caribbean collectors love her right back. Her work hangs in César Reyes’s highly regarded collection, housed at his home in old San Juan, next to pieces by Chris Ofili, Elizabeth Peyton, Peter Doig, Laura Owens and Puerto Rican artists like Chemi Rosado Seijo and Radamés "Juni" Figeuroa, "artists that I love," says Bernhardt. And she’s far from finished seeking out new inspiration. In February, she’ll travel to Australia for a residency at Sydney’s Artspace, during which she’ll visit Aboriginal painters and communities. 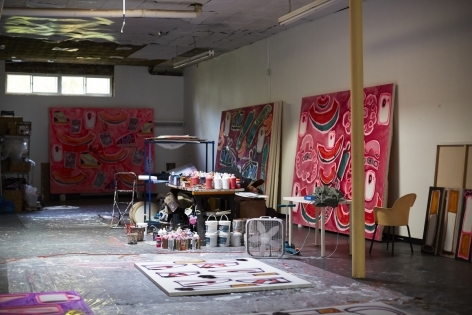 (She may also paint a mural for the Sydney Biennial.) But before that, a trip to the suitably tropical climes of Miami is in store, where she’ll have work in the Rubell Family Collection’s all-female show during Art Basel in Miami Beach and paint the interior of a 25-foot-square swimming pool at Nautilus, a SIXTY Hotel, in a special project for Artsy and the hotel. (Installations by Dan Colen, Mira Dancy, Eddie Peake, Nick van Woert, and Chloe Wise will also spread throughout the hotel's grounds.) Sea turtles, cigarettes, hammerhead sharks, toilet paper, and Doritos are set to provide the backdrop for fair-tigued swimmers before they wrap themselves in giant towels she’s printed with toucans, sharks, French fries, and Mr. Coffee makers. The winning streak Lindemann describes shows no signs of slowing, but Bernhardt admits looking forward to her Australian reprieve post-Miami Beach. “I just want to take a break and remember why I’m a painter,” she says, but based on her energetic studio practice, deep breaths are scant and downtime doesn’t come easy. Bernhardt works quickly, drawing on the wall and then moving to the floor. Prolifically, too—“No one told Picasso to stop painting so much,” she laughs. As we finish chatting, we stop at four paintings that lay on the floor drying—raw canvases brushed only with outlines. Motioning to the giant canvases rolled up and tucked against a wall, she confesses to saving some of her favorite works for herself. “Someone said they’ll remind Khalifa of his childhood,” she says. If that means recollections of hanging in a kiddie pool while his mom paints the facade of one of L.A.’s hottest new galleries or tagging along down under for the latest phase of her charge through the art world, they are paintings well worth holding on to.